Sandy to mucky shores of softwater lakes and at depths (but vegetative) up to 1 m or more. In all fresh plants seen, from a dozen or more Michigan lakes, the leaves are terete, not flattened, rather yellow-green, thickest about the middle, tapering from there to the apex. The submersed rosettes are easily distinguished at a distance from those of associated rosette-formers, like Lobelia dortmanna, Isoëtes, Eriocaulon, and Juncus pelocarpus. Wholly underwater plants do not flower, but within days of emergence the wet to moist shore of a receding lake may be carpeted with blooming Littorella. The staminate flowers are more conspicuous, on stalks up to 2.5 cm long and with long filaments. The pistillate flowers are at the base of the plant and have an elongate stigmatic style. 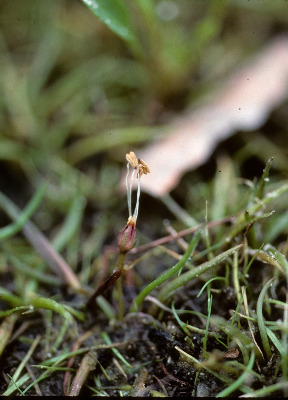 Plants may form colonies by stolons at or near the surface as well as by deeper rhizomes. Our plants sometimes separated as L. americana Fernald. MICHIGAN FLORA ONLINE. A. A. Reznicek, E. G. Voss, & B. S. Walters. February 2011. University of Michigan. Web. 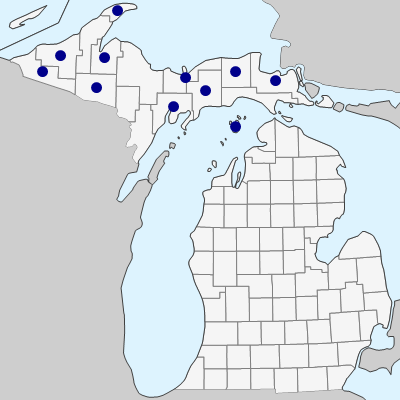 April 21, 2019. https://michiganflora.net/species.aspx?id=1954.